The Bronco was introduced in 1966 as a competitor to the small four-wheel-drive compact SUVs that included the Jeep CJ-5 and International Harvester Scout, and it was built on its own platform. A major redesign in 1978 moved the Bronco to a larger size, using a shortened Ford F-Series truck chassis to compete with both the similarly adapted Chevy K5 Blazer, as well as the Dodge Ramcharger. Most Broncos are usually equipped with a Spare tire swing away carrier found on the outside of the rear end door. From 1966 to 1996 Broncos were produced at Ford's Michigan Truck Plant in Wayne, Michigan. After years of rumors, the Bronco will return for the 2020 model year in its old assembly plant. 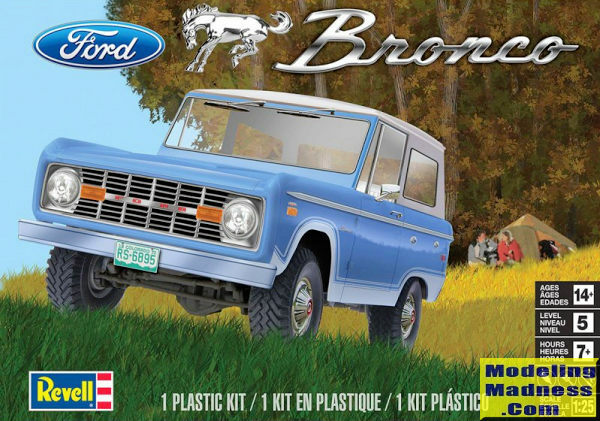 This kit portrays a later first generation Bronco with a 289 V-8 (introduced in 1969) as well as pretty much every available option. When your editor was working at college in the physical plant, the supervisor had a base one of these for his use on campus. It was a gutless wonder, but since it rarely ran above 35 mph and did not leave the campus, except on rare occasions, it was wholly adequate for the task. This is not that same vehicle as Revell has chosen to kit one with pretty much every available option installed. This means that you have the small block V-8 to build up. This is then installed in the ladder chassis that is provided. Since this is a 4WD vehicle, you have a nicely done transfer case. One builds up the rear drive components before installing the front assembly. One is supplied with off-road style vinyl tires into which one places the wheel assemby and the small stub axles. These will then fit into brake rotor looking piece and the axle stub is then glued to whichever corner it is being attached. I should mention that these vehicles were not full time 4WD. One had to turn a section on the front hub to engage the front wheels. Then when going back to 2WD, the same had to be done to disconnect them. Since this is a high-end Bronco, it has a rear bench seat, roll bar, and two 'bucket' front seats. The kit includes decals for the seat and interior door trim. Once the dash and steering wheel are installed in the interior tub, this is then inserted into the one-piece body. Apparently this is either a 1971 or 1973 version as one has to modify the air cleaner housing to do a '73. The 'swing away' spare holder is included and it looks like it can be made functional. A separate hard top is included and thanks to all the flat glass, installing and masking the clear bits should be easy enough. There is a fairly extensive chrome sprue and that is quite nicely done. For those who want to fix any mold seams that have been sanded away, I recommend a product called 'liquid chrome' a google will find some. Note that the windscreen has a black surround to it for the gasket. Instructions are quite clear and easy to follow. Generic color information is provided and while I'm thinking that Revell wants you to paint the model as shown on the box art, these did come in other colors so a web search should prove useful. 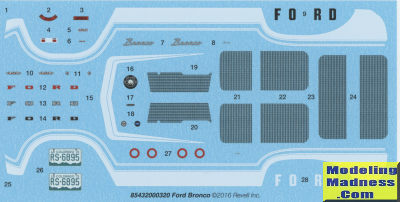 The decal sheet itself is superbly printed and includes all the trim markings, instruments, and FORD logos in several colors. I am not sure how much a subject like this floats your boat, but I find it to be an interesting choice. Personally I would have liked to have seen the six banger provided as an optional engine. Those of you who like things on four wheels and are tired of Ferraris and Aston Martins might want to give something like this a go.